Les Pagodes de Cos Vertical Opportunity! second wine of famed 2nd growth, Château Cos d'Estournel! A savings of almost $50! In stock only at our Rock Hill location. If you order all three, we will give your the vertical price. 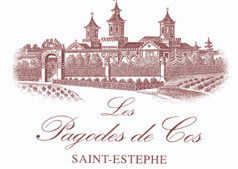 The brilliant 2009 Les Pagodes de Cos actually has more Cabernet Sauvignon in the blend than the grand vin (69% versus 65%) in addition to mostly Merlot and a small quantity of Petit Verdot. As powerful as the Cos in terms of alcoholic clout (14.5%), the full-bodied, round, generous Les Pagodes de Cos exhibits lots of creme de cassis and floral notes intermixed with hints of wood/barrique and spice. Juicy, succulent and remarkably fresh and well-delineated, it merits considerable attention from consumers. It should drink well for 15-20 years. Oddly enough, the second wine is superior to many vintages of Cos in the 1960s 1970s and 1980s! Probably the best second wine ever made at Cos (although the 2009 should not be discounted), the 2010 Les Pagodes de Cos is a blend of 62% Cabernet Sauvignon and 38% Merlot finishing at 14% natural alcohol. This wine exhibits beautiful, silky tannins as well as sweet, rich mulberry and black currant fruit with hints of spring flowers, licorice and subtle toast. A full-bodied, opulent and -ideal- second wine, most people who have tasted it would probably agree that it is actually better than many vintages of Cos d-Estournel from the 1960s and 1970s. Drink it over the next 10-15 years. Named after the Chinese facade of this most extraordinary of wineries, this wine is ripe and smooth in a style that brings out richness and a round character. It's already totally integrated, solid while also very generous. Ivan The Terrible Bourbon Barrel Aged! Napa Valley iconic winery - huge score!